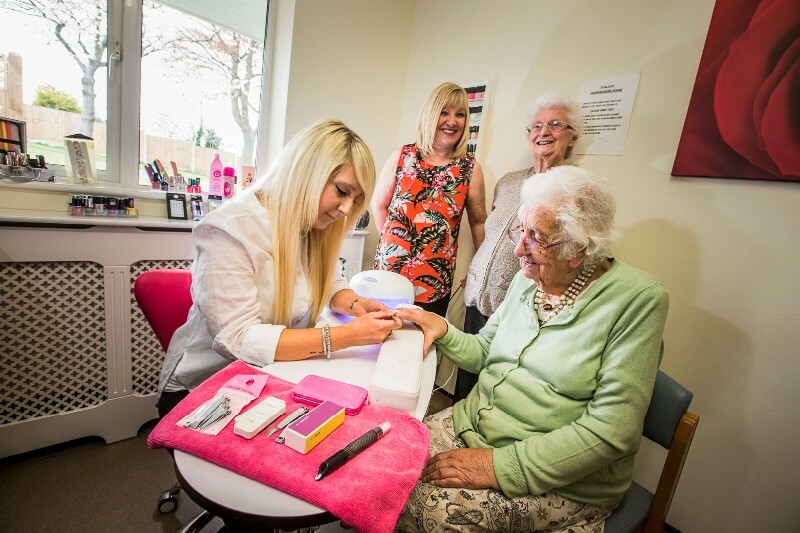 Care home residents are enjoying a touch of glamour thanks to a professional nail bar at the Pen-y-Bryn care home in Bagillt, Flintshire – part of an innovative approach to help the home's residents lead fulfilled lives. As well as the nail bar, staff at the home no longer wear uniforms, for example, and are instead encouraged to come to work in bright colours and flowers to brighten the feel of the home and promote interaction between residents. They also carry sensory items like feathers and musical instruments in their aprons to encourage residents to engage in communication. CFW chair, Mario Kreft, has praised the home, which specialises in dementia care, for its innovative approach. He said: "Helping residents to lead active and fulfilled lives is a priority at Pen-y-Bryn and facilities like the new nail salon have been warmly welcomed by staff, residents and their families,” he said. "I’m proud of the team for continually thinking outside the box to bring community life to the home and make a difference to their residents’ wellbeing," he added. The professional nail bar is proving so popular with the elderly residents that 10 members of staff have now had to be trained in beauty therapy - just to keep up with demand. And it’s not just the women who are benefitting from the new pampering facility; many of the home’s male residents are partial to a hand or foot massage – minus the polish. Pictured below: Senior Carer Rebecca Hughes does the nails of Joyce Hughes while her friend Brenda Wareham and owner/manager Pam Bochenski look on. Pen y Bryn Care home owner and manager Pam Bochenski added: "Care has to change. We all want to get away from the institutionalised care homes of the past where people sat in their rooms all day. I did a lot of research during the building work and really liked the idea of more holistic care. "The residents really like being pampered but who doesn’t? It’s open every day and there’s no need to book, we just open the door. "We’ve always offered hand and foot massages but we wanted to ensure residents could go along to a salon rather than just sitting in the lounge. "With the hand and foot massages in particular, we find it calms agitation and relaxes everybody. We’ll take a resident along to the salon and they can have their hair done at the same time if they want to or just their nails polished, a manicure or pedicure or just a hand or foot massage. "The men go in as well and enjoy a hand or foot massage. A lot of our residents have difficulties with speech but when they come out of the salon they show everyone their nails and this encourages social interaction. "They seem to like the funky colours. It was one of our ladies birthdays last week. She was 95 and so we made sure she had her makeup and nails done before going out with her family. "We have a lady who’s going to be 100 in November so we’re already planning that," she added.